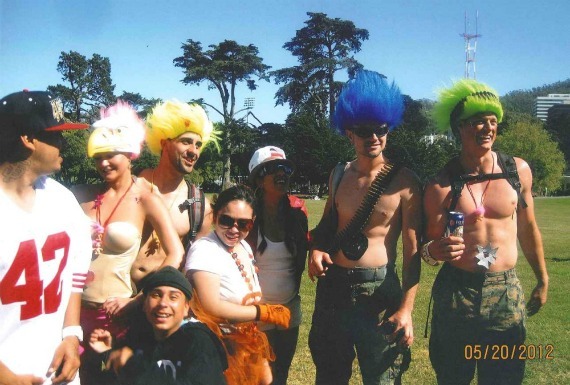 In a press conference yesterday, SFPD released new photos showing two persons believed to be involved in an attack on 30-year-old Stephen Martin at Bay to Breakers last month. Police investigators are now asking for the public's help identifying a man wearing a white 49ers jersey and a woman in a white shirt and orange tutu. According to earlier reports the man in the Niners jersey was part of a group of Latino men in their 20s that had been arguing with Martin before the attack. SFPD Commander John Loftus reports the argument started over a cellphone, but declined to give any more details. Martin, who had just finished running the race and was socializing with the group before the altercation broke out, was described as "incredibly positive" and a "fitness fanatic." He passed away Friday after his family took him off of life support.